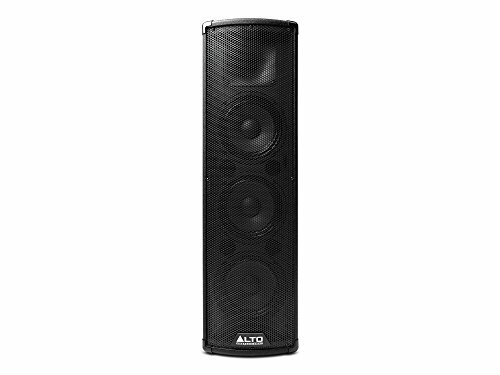 Alto Professional’s Trouper is a compact high-performance PA system that fulfills the unique demands of solo artists and small ensembles. The Trouper leverages technology from our widely-acclaimed Truesonic and Black Series sound reinforcement systems to be the best-sounding and most full-featured small-venue PA system available. When you have more space, the XLR output connects with additional loudspeakers and subwoofers, and Trouper’s wireless Bluetooth capability supports using up to two linked units for stereo backing tracks or background music. Two XLR+1/4-inch combo inputs, a stereo RCA input and 1/8-inch input can accommodate microphones, instruments, DJ mixers, controllers and more. An integrated audio mixer on the back panel enables volume and low frequency/high frequency EQ control on each of the three channels. Trouper is a 2-way 200-watt bi-amplified system (130 watts LF/70 watts HF) with three 6.5” woofers and a 1” high-frequency compression driver, spanning the full musical frequency range from 65 to 20,000 Hz. The system has thermal and dynamic overload protection, so the sound is always clean and clear no matter how hard you push it. How powerful is the Alto Pro Trouper? The Alto Pro Trouper sounds like a monster stack at 200W of peak power and 100W of continuous Class D amplification. The maximum SPL rating is 117 dB-SPL @ 1 meter (continuous, and 120 dB-SPL @ 1 meter (peak). The system also has thermal and dynamic overload protection, so the sound is always clean and clear no matter how hard you push it. How do I pair my Bluetooth device to the Alto Pro Trouper? Press and release the Trouper loudspeaker's PAIR button. The LED will flash, and you will hear a tone sequence. From your Bluetooth device's settings page,enable Bluetooth and select Alto Pro Wireless as the device. When paired successfully, you will hear a final "confirmation tone" from the loudspeaker and thePAIR LED will light continuously. Note: The first time you do this, the process may take up to 60 seconds. Also, if your device prompts you to enter a PIN code to pair, enter 0000 (four zeros). If your device prompts you to select the connection type, select stereo speakers, advanced audio, or a similar option. How far can the Bluetooth connection go? Trouper loudspeaker systems use an advanced, extended-range Bluetooth antenna design, allowing for ranges far greater than traditional Bluetooth devices. The typical range is 60-80 feet (18-24 meters) with a clear line of sight. However, the range may vary depending on your source device and the environment. I'm playing music from my Bluetooth device. Why can I only hear the left side? The Trouper speakers are designed to playback in mono, even when sending it a stereo audio signal via Bluetooth. Instead of summing, or combining, the two sides of your stereo signal, the speaker will simply default to the left side of the signal. When a second speaker is linked, this will then be sent the right side, giving you a full stereo sound. If you are only planning on using one speaker at a time, you can configure your device to playback in mono so you can still hear both the left and right sides. How many Alto Pro loudspeakers can I link together? You can link multiple Trouper loudspeakers in two different ways: using XLR cables or Wireless Linking. Using physical XLR connection cables, you can connect as many Alto Pro Trouper loudspeakers together as you like! Each Alto Pro Trouper loudspeaker contains a Link Output connection on the rear of the speaker. This connection uses a standard XLR cable (not included) to connect to another loudspeaker and the signal sent from this connection is a summed mono signal of all three rear inputs, post-Input Volume. Wireless Linking: First, follow thesteps to Pair a single Trouper to your Bluetooth device. This will set that first speaker as the "Master" and once the second speaker is linked, the second speaker will become the "Slave". The Bluetooth device will send the signal to the Master loudspeaker, which will then relay the signal to the Slave loudspeaker. Make sure no audio is playing from your Bluetooth device. If it is, pause/stop play back and wait 5 seconds. Press and release the Stereo Link button on each loudspeaker. When they are successfully linked, you will hear a final "confirmation tone" from both loudspeakers and the Stereo Link LEDs on both loudspeakers will light continuously. Note:The stereo signal will be split between the two loudspeakers: the master loudspeaker will play the left channel; the slave loudspeaker will play the right channel. Tip: When using two loudspeakers, we recommend labeling the master loudspeaker so you can distinguish between the two in future setups. Whether you are a customer or dealer, if you already own a Alto Professional product, or if you have pre-sales or parts questions, the Alto Professional technical support team is available to help! If you have any questions about this product by Alto Professional, contact us by completing and submitting the form below. If you are looking for a specif part number, please include it with your message.